After an odd encounter at a grand masquerade ball, Lady Emily becomes embroiled in the murder investigation of one of the guests, a sometime actress trying to pass herself off as the mysterious heiress and world traveler Estella Lamar. Each small discovery, however, leads to more questions. Was the intended victim Miss Lamar or the imposter? And who would want either of them dead? As Emily and Colin try to make sense of all this, a larger puzzle begins to emerge: No one has actually seen Estella Lamar in years, since her only contact has been through letters and the occasional blurry news photograph. Is she even alive? Emily and Colin’s investigation of this double mystery takes them from London to Paris, where, along with their friend Cécile, they must scour the darkest corners of the city in search of the truth. I get my audiobooks from my local library. Getting audiobooks from the library is a cheap way to make my work commute, and by default my life, much better. However, there is a distinct downside to getting audiobooks from the library. It’s so difficult to read series as my library is notorious for having only 1-2 books in a series and they are ALWAYS random mid series novels. Rarely do I find the first book of the series. How does this happen?! Anyways, this is how I found myself listening to the ninth book in Tasha Alexander’s Lady Emily series. Normally, I am rather OCD about reading things in the proper order, but I was so intrigued by the mystery that I trudged onward! Side Note: It is easy to understand my confusion previously mentioned in my review of The Lady Travelers Guide to Scoundrels and other Gentlemen. Both authors have the last name Alexander and both books are set in Victorian Europe. Ok, now for the actual review. I’m going to start with all the positive vibes today! I adored Lady Emily. She is such a sharp, intelligent character who somehow manages to remain kind when irked and socially proper while crawling through a cemetery. Not only is she an investigator (not a woman’s job at that time) but she is also a working mom! Emily is a woman who works because she is passionate about her job. And her relationship her husband, Colin, and her friends were just fun to read. There is no unnecessary tension added for dramatic effect. 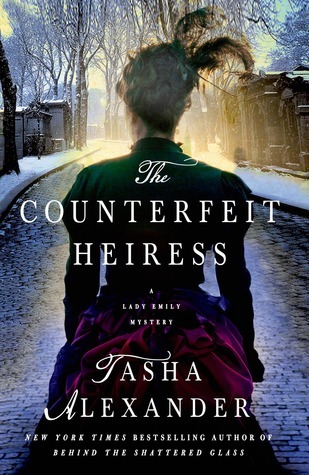 Alexander provides extra clues to the reader with a dual timeline: one that follows Emily’s search for Estella and another that documents Estella’s disappearance in the heiress’ own words. The mystery was twisted, unique, and fulfilling. I will admit that I figured out the ending before it happened (it’s easy when following the clues) but I still found myself uttering ‘no way!’ until the very end. Additionally, the detailed descriptions of Victorian life, such as the costume ball and ‘modern’ photography techniques, were outstanding. I do not really have any negative thoughts to share, besides my library’s lack of audiobooks. (THIS IS THE ONLY TASHA ALEXANDER BOOK THEY HAVE! UGH) I need to read more! Does anyone else read the Lady Emily mysteries? Tell me what you think! Have a great weekend and happy reading!